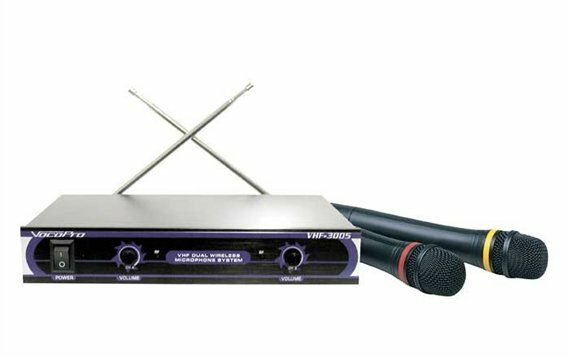 Shop VocoPro VHF3005 Dual Handheld Wireless Microphone System from AMS with 0% Interest Payment Plans and Free Shipping. The VocoPro VHF3005 handheld wireless offers superior sounding vocals, a clear signal and wireless freedom which makes it an easy choice for singers and entertainers alike. The VHF3005 is a dual channel VHF wireless microphone system that is the perfect solution for home karaoke, smaller gigs, public speaking and more. Both channels include individual volume controls for precise vocal balancing and individual 1/4 inch outputs for use with a receiver or mixer, allowing you pro-quality control over your vocal mix. The VHF3005 is great for home entertainment, yet it has what it takes to withstand the challenges of public use. It is designed to better resist outside RF interference, so you can sing without any unwanted distractions. Set yourself free with the VHF3005 dual wireless system that is built to last and that will keep you sounding great for years to come. Worth every penny. Highly recommend. Don’t pass this up!!! DYNAMIC!!!! The sound of these mics will blow you away!! Quality is awesome and even my installer was extremely impressed!! It kinda puts the “other” mics to shame!!! Great choice and you will be satisfied!! just use this product and it is wonderful. Flat response, very low gain, weak signal.